Molly is a 30 year old mother who was working and going to school when she was diagnosed with large cell lung cancer. As a smoker for half her life, Molly was faced with a terrifying and painful disease that could have been prevented. Molly was a teenager when she started smoking. In the beginning, it was a social activity she’d do with her friends: someone would steal cigarettes from a parent or older sibling, and they’d sneak off to the park to smoke them. Smoking was also a normal part of Molly’s family growing up. Many relatives on both sides of her family smoked. So, frequently being around smokers and smoking, she tended to see it as a normal activity. “Don’t do it!” are Molly’s words of wisdom to teenagers who are feeling pressured to smoke or are thinking about starting the lethal habit. She points out, using herself as an example, it is an activity that slowly kills yourself. Because she didn’t want to scare them, it took Molly a while to be brave enough to tell her kids that she had cancer. When she did, Molly used the illustrated children’s book When Mama Wore a Hat by Eleanor Schick (Wyeth) to help explain what was happening. Schick, an esteemed children’s author and illustrator, wrote When Mama Wore a Hat, suitable for four to eight year olds, in order to help them understand illness. This entry was posted in Smoking and Cancer and tagged early exposure to smoking, eleanor schick, large cell lung cancer, lung cancer, quit smoking, smokers lungs, smoking habit, social smoking, stop smoking advice, teenage smokers, when mama wore a hat, winning fight against cancer, wyeth on October 7, 2011 by erin_legg. If you want to stop smoking then pack your bag and fly over to New Zealand. While you are there New Zealand tobacco regulatory agencies will offer you the facts on smoking dangers and by 2017 you may have to leave the country to buy tobacco products. New Zealand is one of the many countries incorporating smoking bans, and like Canada they are banning smoking in your car. In New Zealand now you could be fined for smoking while driving in your car. Seriously, it does matter if you smoke while driving. You are polluting the air around you with second hand smoke. Windows up, windows down; it doesn’t matter. Passengers who are riding with you including young children are also subject to your second hand smoke that could lead to potential harm, like contributing to asthma and other bronchial ailments. Young children are more at risk for these ailment because their lungs, like the rest of their bodies are still in the development stage. The casual cigarette puff near a crib where an infant may be sleeping has been known to result in Sudden Death Syndrome. Children’s lungs actually take in more air because they breathe faster. They are unable to turn away from the smoke and of course infants do not know how harmful the smoke from tobacco is or even what it is. A child who is around an adult smoker might draw closer to the lite cigarette because it is something new and their curious minds want to investigate. They do not know any better. Adults may not want to smell your second hand smoke either. Many people are polite and will tolerate the fumes when they accompany you walking, driving or riding in a car. Also, think about it. Many friends will endure second hand smoke before offending you. You might ask how you will feel if in time they suddenly fall victim of an unexplained bronchial infection, cancer, and other ailments that are known to be smoker related. If we take the initiative and see what’s working for the people of New Zealand, (we are not saying they are doing everything right) we might learn something. Their smoking rates are considerably lower than those in other countries, including the US. Why not concentrate on more aggressive efforts to teach our kids not to smoke. How about becoming a good example by not smoking nor exposing our children to friends who still smoke. These three actions would be a good start. Paying higher premiums for healthcare services could also be a major game changer to help smokers quit. New Zealand is on the right track to help smoking statistics drop in their country, which will in turn improve the quality of life for everyone. In fact, on September 5th, 2007, Action on Smoking and Health (ASH) in New Zealand called for the removal of tobacco from sale by 2017. This entry was posted in Tobacco Regulation and tagged new zealand smoking bans, smoking dangers, smoking deaths, smoking risks, smoking statistics, smoking studies, smoking study, stop smoking, stop smoking advice, stopping smoking, tobacco addiction, tobacco research, tobacco smoke, tobacco smoke exposure, tobacco statistics on April 28, 2010 by sanbreck. Smoking does not just cause health problems. There are other cigarette dangers that go beyond the the obvious. They are a known fire hazard as well. Fires caused by cigarette smoking are disastrous because an unattended cigarette can destroy an unknown number of lives directly and indirectly … and in an instant. Smoking accounts for more than 23,000 residential fires in a year nationwide. That’s why some insurance companies offer to reduce premiums if all the residents in the house do not smoke. Insurance breaks for households where the occupants don’t smoke is probably one of the major reasons why smoking is no longer allowed inside or on the grounds of most work places hotels, restaurants, and pubs. FACT: Smoking materials (i.e., cigarettes, cigars, pipes, etc.) are the leading cause of fire deaths in the United States. Roughly one of every four fire deaths in 2007 was attributed to smoking materials. In 2007, there were an estimated 140,700 smoking-material fires in the United States. These fires caused 720 civilian deaths and 1,580 civilian injuries. More fatal smoking-material fires start in bedrooms than in living rooms, family rooms and dens. Older adults are at the highest risk of death or injury from smoking-material fires even though they are less likely to smoke than younger adults. The most common items first ignited in home smoking-material fire deaths were upholstered furniture, mattresses and bedding. Worldwide the loss of material goods and real estate is in the billions of dollars. Who Do Fires Caused by Cigarette Smoking Hurt the Most? Young children are the most vulnerable because their inquisitiveness and thirst for knowledge make them easy targets for experimentation with things they do not quite understand. Toddlers crawl from pillar to post putting things in their mouths like lighters, cigarettes (new and used) and pipes. They are only imitating what they see their adult mentors do on a daily basis. Adults to seniors, although on the opposite end of the spectrum of young children, fair no better because they can get careless and nod off to sleep, dropping that lit cigarette on a mattress, sofa, or carpet. Smoke inhalation is such a powerful thing that it can keep you asleep longer and deeper than that well known brand of sleeping pill. We must also mention those who are left grieving for their lost loved one. We must also mention the family that survived the fire is left behind to grieve for the loved ones they lost. They’re still trying to understand how something so small as a cigarette could have caused so much damage. And then there is the neighbor, tired after a 10 hour work day. She arrives home while on the way thinking about a nice hot bath and a good night’s sleep to learn that she is suddenly homeless. The cigarette smoker next door may have caused a fire that consumed everything she owned other than the clothes on her back and the shoes on her feet. 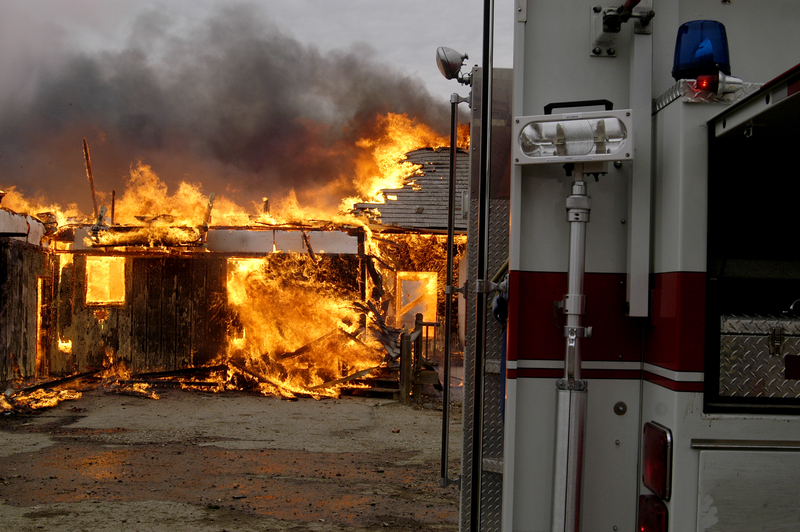 Cigarettes are the number one cause of house fire fatalities. And we haven’t even mentioned outdoor fires causes by careless smokers. Fires caused by cigarettes result in around eight-hundred plus deaths each year. These fires usually occur when a smoker falls asleep without extinguishing a cigarette. House fires from unattended cigarettes generally occurs at night, when the whole family is asleep, which can make it difficult for everyone to evacuate in time. If you or another family member has a tobacco habit, make sure that no one ever smokes in bed. As of March 2010, all 50 US states passed legislation and achieved their goal in getting cigarette manufacturers to produce only cigarettes that adhere to an established safety performance standard. If you do smoke think about others. Stay alert and only smoke outside away from non smokers (and dispose of the butts properly). It is better for your family’s health and this one action will reduce the risk of a house fire. Or better yet, don’t smoke at all and relieve everyone around you from an unnecessary potential disaster. This entry was posted in In the News and tagged cigarette facts, cigarette habit, smoking, smoking dangers, smoking deaths, smoking risks, smoking statistics, stop smoking advice, tobacco addiction, tobacco related deaths, tobacco smoke, tobacco smoke exposure, tobacco statistics on April 13, 2010 by sanbreck. Breathing exercises too can prove to be useful in controlling the urge to smoke. It is common knowledge that the human body takes in a lot of toxic substances, both through the air and through food and drink. Apart from this, various toxins are also released in the body as a result of the various processes that are going on. These toxins have to be released on a continuous basis or else they will accumulate in the body with serious results. One of the best ways of releasing these toxins is by means of exhaling while breathing. One funny fact is that most of do not breathe properly. Just take a look at the picture like this. So it is imperative that we make an honest attempt to breathe properly. But first of course we have to make sure that we are breathing in unpolluted air. The time best for breathing exercises is early in the morning when the air is comparatively unpolluted. Now what you have to do is this. Again, sit comfortably so that there is no strain to any part of your body. It is not imperative that you close your eyes, but I have always noticed that the exercise works better when the eyes are closed. When you are ready, what you have to do is to breathe in deeply and slowly, and feel the fresh air filling up your lungs until it just can’t take any more. Conjure up images of the air encircling throughout your body and reaching every cell, literally bathing it with oxygen. Of course it doesn’t happen that way but the image helps a lot. Then hold your breath for a few seconds and then very slowly exhale letting out all that foul air. Again conjure up an image of all the toxins being released from your body. Every cell has become free of the burden it was carrying. Now pause for a second or two and again breathe in deeply, slowly letting your lungs fill up with all that good, clean, rejuvenating air. Repeat this exercise at least ten times and take your time for it taking care not to rush through. When you have done that part of the exercise it is time for the second part. Again sit with your eyes closed, but this time, keep one nostril closed with the help of your index finger. It is best to close the right nostril first and that too with your right index finger. Now breathe in deeply and slowly through your left nostril keeping the right nostril closed. When you have held air for a second or two, release your right nostril and breathe out through it. While you are breathing out conjure up an image of all the toxins being released form your head and the brain especially. And as you breathe in conjure up images of the clean air circulating though out your brain freeing it of all the worries and trouble and lightening it. Repeat this exercise with the other nostril closed and in this way alternate between the nostrils at least ten times. The entire breathing exercise need not take more than ten minutes. But you will be surprised at how light hearted and free you will feel after the exercise. Once you have practiced it for three or four mornings, you will be in a position to do the exercise each time you get the urge to smoke. The breathing exercise can easily become a substitute for the urge to take in that hourly doze of nicotine. This entry was posted in Tips and Support and tagged breathing exercises, deep breathing, quit smoking technique, quit smoking tips, stop smoking advice, stop smoking tips on March 24, 2007 by sanbreck. Nowhere in any industry does the term “killer marketing” apply better than in Big Tobacco. If Big Tobacco is successful in marketing its products to existing addicts, ex addicts and new victims, it will definitely kill its target audience. And it seems that marketing executives have become so “clever” (if that’s the word you would use to describe somebody who’s found a way into talking somebody into doing something that will end his or her life) it frightens me. One of my Quit Buds has been smoke-free for 233 days. Her addiction manifested in the form of Camels before she decided to break free. I can’t imagine that a tobacco company could know that she specifically had quit, or hadn’t purchased any of their product in over 200 days… but something caused them to decide to send her some coupons this week. They had never sent her coupons in the mail before. It freaked her out. What was worse – they came in the exact shape and size of a pack of sickarettes. Maybe to a tobacco company, that would be cause for laughter. Not for me. As she told me of her experience I was almost numb with shock. I’m about 440 days into my Quit (438 to be exact) and if that had happened to me, I would have over-reacted. I would have rushed to the kitchen and found the tongs in the utility drawer. I’d don my HAZ-MAT gear and put on rubber gloves, and take those tongs to pick up the pack with. Carefully… slowly… I’d put the pack into the sink and turn on the water – full force! While the water rushed over the pack, I’d take my meat tenderizer and pound the stuffings out of the pack and let the water rinse away the whole mess. Then I’d turn on the garbage disposer and leave it running for 20 minutes. That’s nothing to play with! I keep a stack of index cards handy, where I used to keep my pack of smokes. There are about 75 cards in the pack. It grows over time because on each card I have carefully written one reason why I enjoy being free, one benefit to not having to be a slave to a tobacco addiction any longer, one phrase or comment a family member has made to tell me how glad they are I’ll be around a while longer than if I’d continued to smoke. So if I ever do get a piece of “killer advertising”… I’ll be ready with my own pack to reach for. This entry was posted in Smoking Facts and tagged big tobacco, nicotine addiction, stop smoking advice, stop smoking tips, tobacco addiction, tobacco marketing on March 15, 2007 by sanbreck. Dain Bramage is what you get when you quit by using the patch, and my daughter’s got it in spades right now. Please don’t think I’m poking fun at my own daughter! I only know the syndrome because I myself used the patch as directed, and I instantly lost about 80% of my IQ points. The first 2 weeks of my Quit were like being strung out on some kind of mind-numbing drug. Oh wait – the 21 mg patch is a mind numbing drug! Thankfully my girl has a good job with a good boss and good people to work with. I contract my services out, which means if I don’t work, I don’t eat. Quite literally, my whole livelihood was at stake. If I am unproductive I don’t pay bills, I don’t have electricity, I don’t have internet, I don’t have anything unless I have the ability to work and get stuff done. I wrote to every single one of my clients. I told them that, to my way of thinking, if I didn’t quit now I’d be smoking until I died, and that day would come too soon for my liking. I simply appealed to them to stick with me. I warned them that, realistically I could be looking at another 2 months of spotty performance of my duties. I told them I could be snappish or prone to tears. I told them that, even though I knew I could lose my very fragile new business, I still felt I had to go for it. Every one of them stuck by me. Not one said “I’ll take my business elsewhere.” And, surprisingly, I learned that many of them have first-hand experience with the symptoms that arise when quitting smoking because they smoked in the past as well. I went through a period of slim rations, to be sure. It wasn’t easy in a lot of ways… but in all the ways that count, it has been wonderful. I’ve returned to being a productive professional, and I can say without hesitation that every day beyond that 2 week mark represented a steady improvement in my ability to function professionally. From Day 9 on, every day was a great place to be. The worst is behind you by that point, so every day is a new discovery of how good it feels to be Quit. You begin encountering all sorts of benefits, without even anticipating them. The day my taste and smell came back… WOW. Then a week later — double wow — MORE taste and scent! No more yellow-stained fingers. My skin improved, my teeth get whiter and whiter and whiter. It just keeps getting better and you’ve got even more good stuff ahead. Every crave’s voice gets weaker, and every day you feel the freedom more and more. People look at you and say “Did you do something different with your hair?” But you know it’s the wonderful smell of your shampoo they’re noticing. Somebody looks at you one day and says “What kind of skin care do you use?” because your face is just so… radiant! Somebody else says “Did you take a vacation or something? Been to a tanning salon?” because your skin is much rosier and not so gray anymore. It just unfolds, and it is all so very wonderful, so liberating, and adds so much to your self-respect and self-esteem. Please set aside your panic and fear and think long and hard about what is important, where to place your priorities. I don’t know what stage of life you’re in, what your quit motivators are, if you’re a kid or a parent or a grandparent like me. All I know is – somebody loves you. To somebody, you are the sun, the moon, the starlit sky. There is somebody that you’re unaware of who thinks of you every day. There’s somebody who has always loved you. There are many who need you in their lives. People you know, people you went to school with, people you haven’t seen in years. All of us who are addicted struggle to regain our freedom and learn to live smoke-free. We know we are addicts, and we do understand that recovering from an addiction means a period of detox. It’s part and parcel of what we have done to ourselves by starting to smoke. We help each other through and we survive. Stick with it – because oh MAN is it ever worth it! Don’t let the whole “dain bramage” syndrome stand in your way. Work will always be there. I hope you will be, too. This entry was posted in Tips and Support and tagged quit smoking tips, stop smoking advice, stop smoking help, stop smoking story, stop smoking support on March 7, 2007 by sanbreck.